When it’s about pet surgery, pet owners look for trusted veterinarians who can undertake safe surgical procedure. 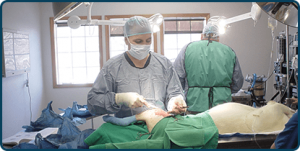 We, at Westheights Veterinary Hospital Kitchener, have successfully undertaken many kinds of pet surgeries such as spay, neuters, soft tissue, bone surgeries and dentistry among many others. Each animal surgery is done with the utmost care and using appropriate vet surgical equipments. We implement safe and proven practices in our surgical procedures to increase chances of success. Pre and post-operative care, advanced diagnostic and professional surgical services is all that you can expect from our animal hospital in Kitchener. For Fracture repair and other minor to major orthopedic surgeries we have arrangements to refer our patients to specialists. All animals must have been administered core vaccinations, and have written proof of the same prior to the surgery. All animals must be off food or water by midnight the day before surgery. All animals being admitted for surgery should arrive at the hospital between 8.30- 9.00 the morning of surgery to be admitted by a veterinary technician. New clients/patients will also be seen by a veterinarian. Surgeries take place on Monday to Friday. If you cancel or reschedule surgery with less than 24 hours before your appointments time, you will be charged $50. Our vets ensure that the patients have comfortable pre and post surgery experience. They will provide proper discharge instructions to ensure speedy recovery of your pets. Ours is a locally trusted animal hospital offering an array of pet health care services across Kitchener at affordable prices. We have successfully undertaken hundreds of minor to major surgeries. From spaying/neutering to bone or muscle issues, we treat them all.